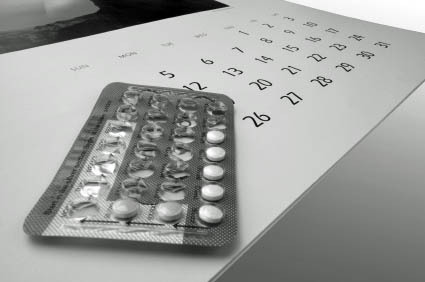 Oral contraceptive is a hormonal pill. It is a combination of oestrogen and progesterone. When taken orally and regularly it acts as the most effective method to prevent pregnancy.Rock, Garcia, Pincus from USA first pioneered in the clinical use of the pill as contraceptive in 1957. The OC is started from the 5th day of a menses. One pill is taken at bed time daily for 21 days. Within a week the next menses comes. The next course is started from the 5th day of the menses. If one pill is missed at any night the missed pill is taken at the next morning. History of liver disease or jaundice with one year. Carcinoma of breast, cervix or uterus. There are some Relative contraindications where it may or may not be used after proper consideration. Women aged beyond 35 years who smoke. Mechanism of action of Oral contraceptiveOral contraceptives containing the oestrogen and progesterone act by their action on the anterior pituitary and hypothalamus. Its action is also at the uterus and the cervix. It causes the abolition of midcycle FSH-LH surge by suppressing GNRH and FSH. These hormones are required for the development of follicles in the ovary. Thus as no follicular development takes place no ovulation occurs. At the Cervix the cervical mucus becomes less penetrable to sperm by the action of progesterone. Endometrial lining of the uterus also becomes unresponsive to lodging of the fertilized egg.All women must have preliminary medical checkups before starting on the pill. Following delivery ovulation is delayed beyond 6 weeks, although it can happen at 4th week when the women are not breast feeding. Thus if the mother is not breastfeeding it is started at 4 weeks and if she is breastfeeding it is started after 6 months because oestrogen inhibits prolactin action on breasts causing poor milk yield. This entry was posted in Diseases & Conditions and tagged Oral contraceptive by Manbir & Gurpreet. Bookmark the permalink.